At the bottom of a small mountain on the West Coast of Italy, towering over a stone-covered beach, is the Abbazia di San Fruttuoso, a beautifully maintained 10th century abbey. And in its shadow, an Italian grandmother is churning out sheets of delicate pasta in the corner of the blink-and-you’ll-miss-it restaurant Da Laura. And during a recent week in Italy, this is where I ate one the best meals of the trip. But I had to work for it. Without any roads, simply getting to the beach is a challenge. San Fruttuoso and its tiny handful of beachside restaurants remain relatively hidden compared to other stops of the Italian Riviera. While boats are available—in the middle of summer they cruise on the hour from the small town of Recco or the smaller town of Camogli—I chose the only other way of getting to the abbey. I started walking. Lunch is to the right. The hike through the Parco Naturale di Portofino wound steeply down hundreds of vertical feet along a creek. And on a 90 degree day like the one I chose, the cold water from the creek and ripening blackberry bushes that dotted the trail were welcomed ways to stay refreshed. But a couple of hours later, at the bottom of a final set of stone steps, I finally arrived for lunch. And that’s when the good stuff started. Da Laura is an unorthodox sort of eating establishment—a rustic, beachside pasta shack. And the food was equally simple. Rather than a heavy stack of noodles and cheese, Da Laura’s lasagna is a few sheets of pasta, which I saw rolled out by a wise-looking woman no more than ten feet from my table, and topped with pomodoro or pesto and a generous shaving of Parmesan. Yet the sparse dish rivaled the pasta from any of the more cosmopolitan restaurants in the area (restaurants that have things like real roofs and stoves). Let this be a lesson to us all: The only things you need for an amazing meal are a hand-cranked pasta machine and a septuagenarian to operate it. 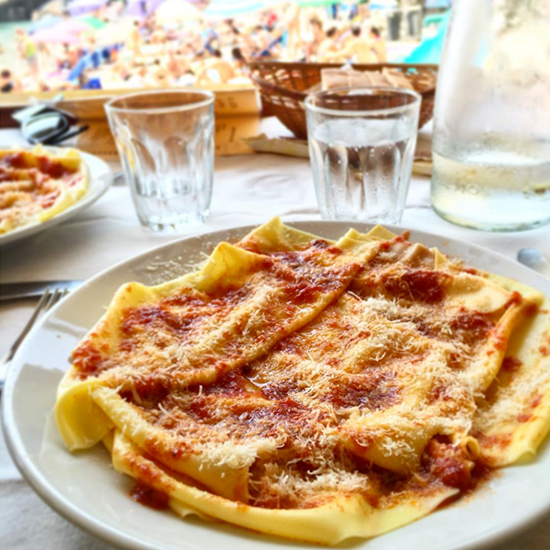 That awning on the far side of the beach houses some of the best pasta you'll find. The only downside to the meal? After you finish eating, it is still a hell of a walk back up that mountain.